This summer, I have been interning with Richard McCoy in the Objects and Variable Arts Lab at the Indianapolis Museum of Art. Check out my latest blog post on the IMA blog (re-posted below) about waxing bronzes with fellow intern Katie Roth. 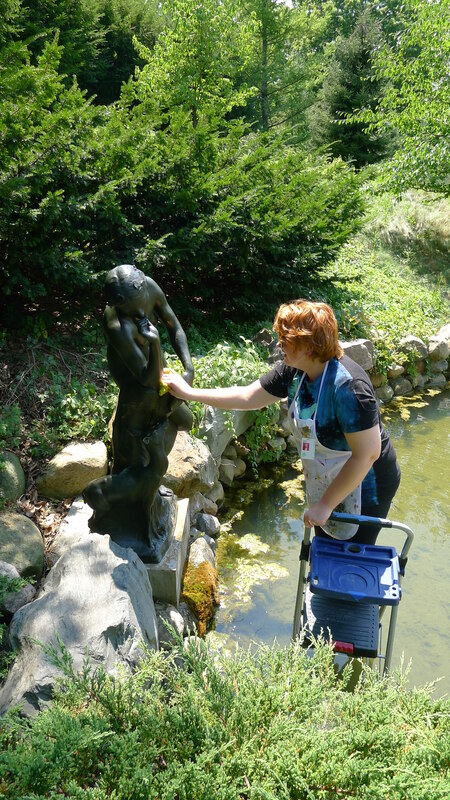 It’s been a record-setting summer, but not hot enough to stop me and fellow objects conservation intern Katie Roth from braving the heat to conserve several sculptures on the grounds of the Indianapolis Museum of Art. 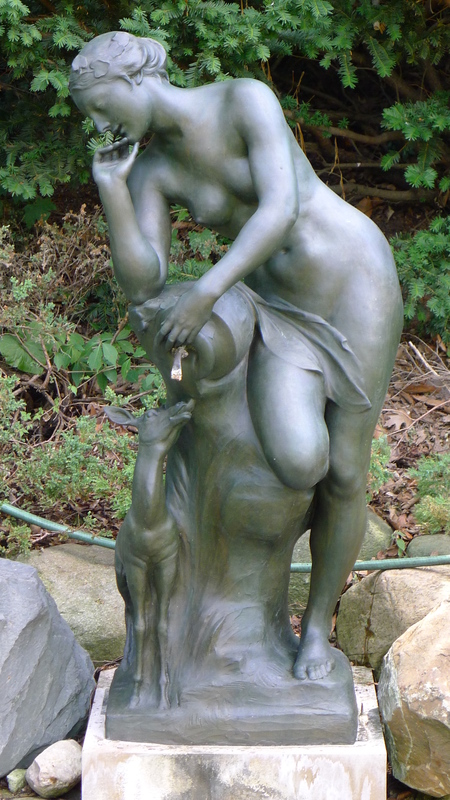 Our most challenging project has been Isidore Konti’s fountain, Nymph and Fawn. 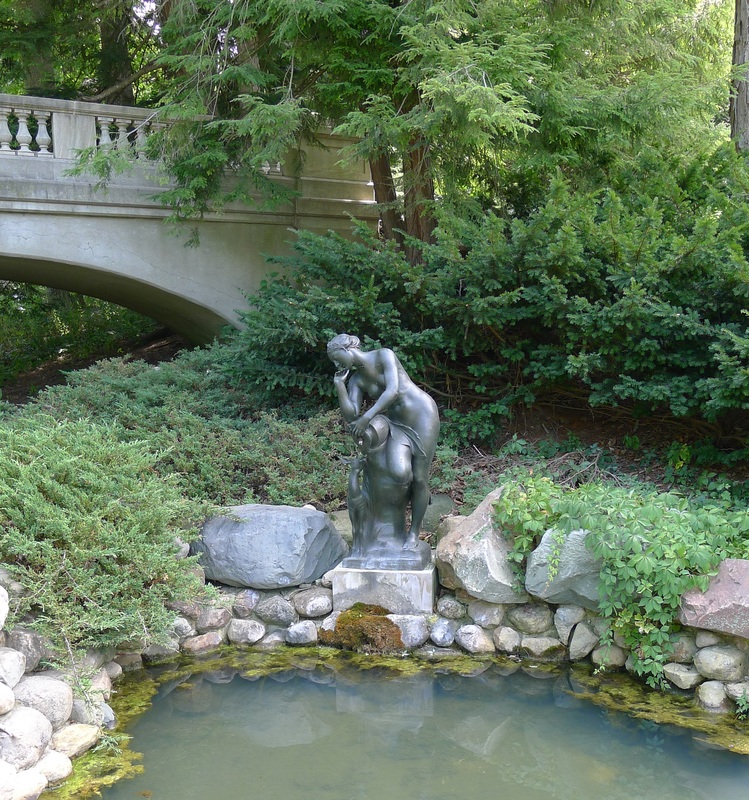 The fountain is placed at the top of the ravine garden on the historic Oldfields estate. It’s also surrounded by prickly and somewhat poisonous foliage (like poison ivy!). To start the project, Katie and I made our way with IMA conservator, Richard McCoy, out to the pond and formulated a game plan. This treatment project was to re-apply a wax coating to the surface of the sculpture with the goal to prevent further deterioration of the bronze and maintain its historic appearance. First things first, we washed the sculpture with Orvus soap and water to remove all the dirt and grime that builds up from the sculpture being outdoors. Nymph and Fawn was covered in cobwebs, bird guano, and plant debris. Nymph and Fawn covered in cobwebs. After sufficiently scrubbing and bathing the duo, we pulled out the propane tank, blowtorch, and wax that was specially made at the IMA for outdoor bronzes. Then we set up our propane tank, hooked up the blowtorch, and started heating up the surface. The goal is to heat up the sculpture so that it reaches the melting point of wax. You know the surface is hot enough when it looks wet — this is because the heat is pulling out the moisture from within the sculpture and bringing it to the surface. The wax is then rubbed on the surface and begins to melt like butter. Once enough wax has been applied to an area, a brush is used to evenly coat the surface. Katie had a penchant for the torch, and I was more than happy to hand over the heat while I waxed and brushed. We found a nice rhythm, heating and waxing until we had completed three-fourths of the sculpture: both of the sides and the back. Now, the trick was to find a way to wax the front–the side facing the pond. Because Nymph and Fawn is placed so close to the edge of the water, the front isn’t easily accessible from the shore. After some careful consideration, we determined that to wax this side we’d need to get in the pond. After putting a stick in the water to determine its depth, we found that neither of us was tall enough to stand in the pond (particularly not me, at a mere five feet and two and a half inches!). To solve this problem, we placed our stepladder in the water, then climbed out onto the ladder from the edge of the pond (with the propane torch!) to heat and wax from that angle. Luckily, it worked! And though we each very sustained minor burns, no one fell into the pond — though I don’t think we would have minded cooling off a bit. Anisha heating up the bronze with a blowtorch. The next day, we came back to apply a cold paste wax, Trewax, using a brush. 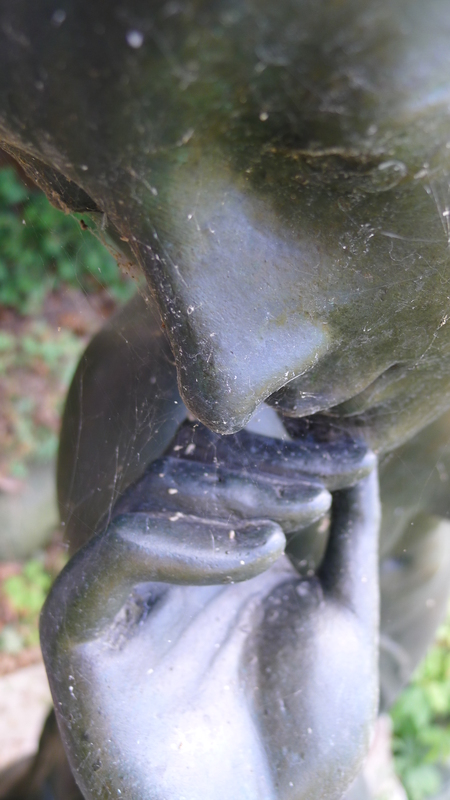 Cold wax is applied as a barrier between the sculpture and moisture in the air. Finally, the following day, the whole surface was buffed to a shine using damp cloths. This ensured that the wax was fully absorbed into the bronze and evenly coated the surface. After a few days of hard work, Nymph and Fawn gleamed in the sunlight. I’ve noticed in my time at the IMA that many aspiring artists like to sit near the pond and paint or sketch the pair — we’re happy to have cleaned them up for everyone to enjoy. If you’re interested in learning more about the conservation of bronzes, check out the blog post by former IMA interns Jessica Ford and Katherine Langdon about their work cleaning the bronze Sewall torches at Herron High School. Considine, Brian B. Conserving Outdoor Sculpture: The Stark Collection at the Getty Center. Los Angeles: Getty Conservation Institute, 2010. Print. Naudé, Virginia Norton. Sculptural Monuments in an Outdoor Environment: A Conference Held at the Pennsylvania Academy of the Fine Arts, Philadelphia, November 2, 1983. Philadelphia, PA: Academy, 1985. Print. Naudé, Virginia Norton, and Glenn Wharton. Guide to the Maintenance of Outdoor Sculpture. Washington, D.C.: American Institute for Conservation of Historic and Artistic Works, 1993. Print.